It is my intent in the next while to present an overview of my several works-in-progress. 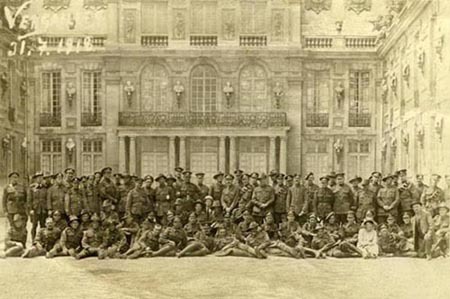 In homage to the 100th Anniversary of the First World War, I am seeking to identify and record the names and histories of the eighty soldiers and three civilians in my grandfather’s small treasured photograph taken at Versailles, Paris on July 31st 1918. Like my grandfather, many of these men were likely wounded, or worse, were killed or went missing during the needless fighting of the last one hundred days of the war which ended with the armistice of November 11th, 1918. Please contact me if you recognize anyone in the photo or have any information relevant to my search. died at No. 48 Casualty Clearing Station, Battle of the Marne, France, July 28th 1918. Toronto's Old Chinatown, Dundas Street West viewed south between Bay and Elizabeth Streets, October 1983. Toronto's Old Chinatown, Dundas Street West viewed south between Bay and Elizabeth Streets, August 1987. Toronto's Old Chinatown, Dundas Street West viewed south between Bay and Elizabeth Streets, March 1996. James Clandening U.E., a Private in Butler's Rangers, his x mark 1786. Jonathan Mathews U.E., a Private in Butler's Rangers, his x mark 1797. John Byrnes, one of Colonel By's men, signed 1829.